The Yakima RocketBox 15 Cargo Box is the great answer to solving your problem of trying to get a few of your friends together for a weekend outing accompanied by your gear. You won’t ever have to worry about having to put gear on your friends’ laps again. They will have their own space, on the top of your vehicle. The gear, not your friends. The Rocketbox is ideal for sedans and will provide you with all the extra needed space. You and your passengers can enjoy the ride with comfort while your gear is safely stored above. This box is great for short roofed vehicles or for larger ones looking for added storage. This unit is very quick to install and it works quite well with many roof rack bars. It’s quite durable and can handle pressures brought on by rough terrain and Mother Nature. Durable cargo box made from high-quality plastic. Measures 58 x 38 x 15 inches. Compatible with most factory, rounded and square bars. Comes with a standard lifetime warranty. The Yakima RocketBox 15 Cargo Box was reviewed by 16 different customers. Even though not too many people gave reviews, the ones that did, gave above average reviews. It received 4 and a half stars out of a possible 5 star rating system. Several had commented that it was easy to install and said that it did not shift when driving on the highway. This same commenter also liked the fact that it was very easy to clean off the bugs, especially from a long drive. Many agree that it does hold a lot of gear, but even though it can hold a lot of things, you should always be weary of the weight capacity. 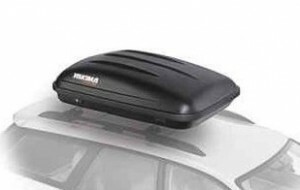 It does fit perfectly on the roof of any car, unlike many other cargo boxes available on the market, it is not as long. It has a nice design, shape wise and it is very aerodynamic. If you have a sedan or hatch back, you do not have to worry about the end of the box hitting the trunk. Though, many have said, it is easy to install, it may still require two pairs of hands to install. Some have said that after how many miles of driving with the Rocketbox, it still has no effects of wear. There is little or no noise that can be heard. To demonstrate the capacity of the cargo box, one reviewer had said that he was able to fit in a set of golf clubs and several duffle bags. Load is distributed evenly because of the wide design. With the narrow boxes, the nose and the tail of the box has a possibility of extending out past either the windshield or the rear window. The only disadvantage to having a wider box is that you can’t mount a lot of other objects like skis and bikes. The floor is not flat and you may need to add something like a couple of mats. Some reviewers suggested using Armor-All or something similar to protect the box from possible UV because over time it can weaken the plastic.